"To survive a war, you gotta become war." Don't mess with Rambo. Our friends at Grey Matter Art have unveiled an officially licensed printed for Rambo: First Blood Part II starring Sylvester Stallone as they continue to reveal art in their Rambo series. This new print is by artist Anthony Petrie (known best for his fantastic movie map art) featuring Rambo with his bow & arrow from the second movie. The variant version of this print changes the background and colors a bit, making it almost look like it was printed on metal (though that doesn't seem to be the case). Prints are priced $45/$55 and go on sale next week. Take a look. 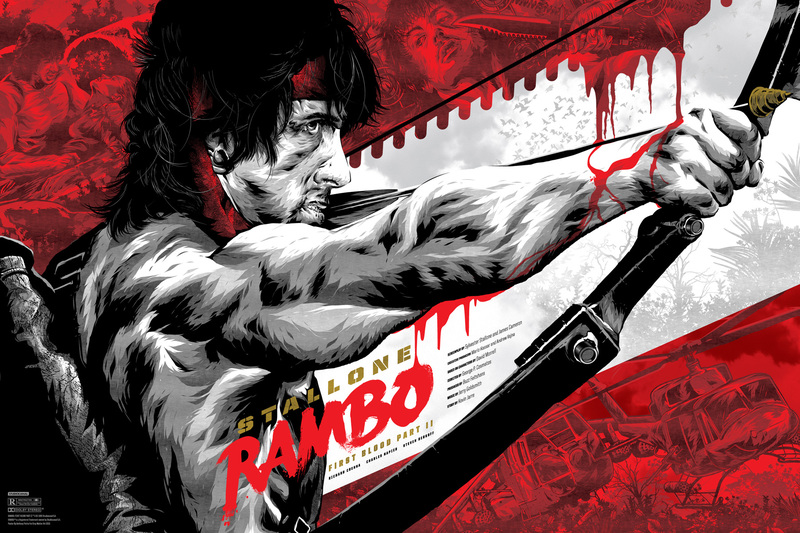 Here's the Rambo: First Blood Part II screenprint artwork by Anthony Petrie being sold by Grey Matter Art. And here's the variant version of the Rambo: First Blood Part II print, click it for full. This runs $10 more. You can also see the other original Rambo print made by Gabz for Grey Matter Art by clicking right here. Rambo: First Blood Part II was first released in May of 1985, following the huge success of First Blood in 1982. This one made even more at the box office. In this sequel, John Rambo is released from prison by the government for a top-secret covert mission to the last place on Earth he'd want to return - the jungles of Vietnam. It's a whole different movie, yet just as crazy awesome. Grey Matter Art's 36"x24" screenprinted poster will be released on Tuesday, April 21st on their website shop page at 1:00PM EST. If you really want to grab this, mark that down in your calendars at that will be your best shot. Follow @GreyMatterArt. Rambo now half wolf ? Y E S ! // I need the new RAMBO movie stat!